Starch Extreme Ironing on Rivelin Needle. Extreme ironing (also called EI) is an extreme sport in which people take ironing boards to remote locations and iron items of clothing. According to the Extreme Ironing Bureau, extreme ironing is "the latest danger sport that combines the thrills of an extreme outdoor activity with the satisfaction of a well-pressed shirt." Part of the attraction and interest the media has shown towards extreme ironing seems to center on the issue of whether it is really a sport or not. It is widely considered to be tongue-in-cheek. Extreme ironing has become something of a cult in recent years, with "ironists" taking their chores to places as inhospitable as the Antarctic, the bottom of a Welsh bog, and in the middle of a go-kart race at Streatham Raceway. Agencies, T. C. (2008, April 01). 'Extreme ironing' on the sea bed in new record. Some other locations where such performances have taken place include a mountainside of a difficult climb; a forest; in a canoe; while skiing or snowboarding; on top of large bronze statues; in the middle of a street; underwater; in the middle of the M1 motorway; race; whilst parachuting; and under the ice sheet of a frozen lake. The performances have been conducted solo or by groups. 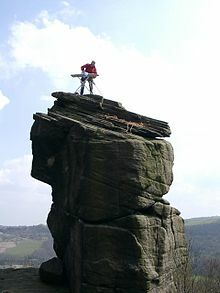 Extreme ironing came into existence by Tony Hiam in 1980, near Settle in the Yorkshire Dales National Park, England. Inspired by his eccentric brother in law, John Slater, who ironed his clothes even when camping in a tent, Tony illustrated the futility of unnecessary ironing by doing it in bizarre situations such as mountain-lookouts, crowded airport departure lounges, on top of telephone kiosks and charity clothing bins. Until 1990 Tony often carried ironing board plus iron in his car-boot, on the lookout for opportunities to cause bystanders to glance twice, thinking: "Did I really see that?" Some purists of the sport, apparently unaware of its early origin, claim that it was started later in 1997 in Leicester, England, by resident Phil Shaw in his back garden. Shaw came home from what he recalls as a hard day in a Leicester knitwear factory. Shaw had a number of chores to do, including ironing his shirts. Preferring the idea of an evening out rock climbing, he decided to combine the two activities into a new extreme sport. In June 1999, Shaw, who uses the nickname "Steam", embarked on an international tour to promote the activity. The stops included the United States, Fiji, New Zealand, Australia and South Africa. An encounter with German tourists in New Zealand led to the formation of a group called "Extreme Ironing International", and the German Extreme Ironing Section or GEIS. This has yet to popularize in North America. The sport gained international attention after a documentary entitled Extreme Ironing: Pressing for Victory, was produced for Britain's Channel 4 by Wag TV. The program followed the British team's efforts and eventual Bronze and Gold placings in the 1st Extreme Ironing World Championships in Germany. A side-story looked at the rivalry between the EIB (Extreme Ironing Bureau) and a breakaway group called Urban Housework who were trying to establish their own extreme sport based around vacuum-cleaning. The film later aired on the National Geographic Channel. In 2003, John Roberts and Ben Gibbons from Cheltenham, Gloucestershire ironed a Union Jack just above Everest Base Camp. This is believed to be the world altitude record for the sport. The reported height was 5,440 metres above sea level. In 2004, the EIB traveled to the US on the Rowenta Tour to recruit additional ironists and ironed at Mount Rushmore, New York City, Boston and Devils Tower. On 10 January 2009, 128 divers including 6 freedivers, attempted to break the previous world record, managing to confirm 86 divers ironing within a 10-minute period. The event took place at the National Diving and Activity Centre (NDAC) near Chepstow, Monmouthshire, and was organised by members of the Yorkshire Divers internet forum. In addition to breaking the world record, the event raised over £15000 for the Royal National Lifeboat Institution. On 28 March 2011 Dutch diving club De Waterman from Oss, Netherlands, set the new (official) world record extreme underwater ironing. A group of 173 divers set the new world record in an indoor swimming pool in Oss. De Waterman organized this event to mark their 40-year anniversary. In 2012, Extreme Ironing pioneer Steam came out of retirement to take on a new challenge and run the Hastings Half Marathon in March wearing an ironing board, pressing garments on the way. On 16 June 2018 a freediver, Roland Piccoli, ironed a T-shirt at a depth of 42 m (138 ft) in the world's deepest pool (Y-40) in Montegrotto Terme Italy. Extreme Ironing has inspired other forms of unusual extreme activity, such as Extreme Cello Playing. The activity rose high enough in the zeitgeist to land an appearance on the long-running soap opera EastEnders. The 2 August 2004 episode featured a reference to the then-current altitude record holders the Hot Plate Brothers. As the party-loving Kat and Zoe Slater are preparing to go out, they are invited to the launch party at Angie's Den where celebrities - including the brothers - are supposed to appear. Wikimedia Commons has media related to Extreme ironing. 19. Agencies, T. C. (2008, April 01). 'Extreme ironing' on the sea bed in new record. ^ "Man irons on the M1". Student Beanskeirin. ^ "Extreme Kerin Ironing". HighFlange.com. Retrieved 15 February 2010. ^ a b Wollaston, Sam (6 June 2005). "O brother, where art thou". London: The Guardian. Retrieved 16 February 2006. That's because Phil is a star of Extreme Ironing (National Geographic, Saturday). ^ "Worldwide extreme ironing competition launched". Extreme Ironing Bureau. 18 February 2003. ^ "Extreme Ironing". averyj12.weebly.com. Retrieved 3 November 2016. ^ "Pair steamed up on a mountain". www.bbc.co.uk. Retrieved 9 November 2015. ^ St Leonards' divers set underwater ironing record, Michaela Farrington, Geelong Advertiser, 31 March 2008. ^ "Extreme ironing: man presses shirt on M1 motorway". Daily Telegraph. 18 April 2011. ^ "Manic monday Morning on the M1". youtube. 18 April 2011. ^ "Team Steam - Never say never". TeamSteam.org. 1 August 2012. ^ "EXTREME IRONING freediving -42 m". youtube. 6 July 2018. ^ "Extreme Cello playing". BBC. 1 August 2006. ^ Shaw, Phil (3 August 2004). "Extreme Ironing on Eastenders". Extreme Ironing Bureau.